By Keith Cowing on August 31, 2014 7:13 PM. Keith's note: Planets orbit stars. Moons orbit planets. Planets and moons are worlds. Our solar system has lots of worlds and no two are the same - Right? "Planet" and "Moon" define where a world is located - not what it is made of. But it seems that NASA's New Horizons mission has decided that they want to unilateraly rewrite the definitions for these terms and, in so doing, confuse everyone. By Keith Cowing on August 31, 2014 5:58 PM. "Worse, the word "Mars" isn't anywhere in the story. Isn't that the more interesting thing? We're going to Mars? Cool! What are we going to do there? Yet the story doesn't mention such a mission. After digging and digging through the Orion home page, going through all 11 pages of press releases, I didn't find a single story that had the word "Mars" in the title. That's when I went to find the "About Orion" box, way down the page (and copied above) that mentions that Orion might "eventually" be going to Mars. After doing some more research, I don't find anything about an approved mission to Mars, but the earliest they could launch if they do get funding is the year 2020. Absolutely NASA should be doing long-range planning, and absolutely they should be doing public outreach, but if such a mission hasn't even been designed yet, then the "return from Mars at 29,000 MPH" is speculative at best." By Keith Cowing on August 28, 2014 9:47 AM. "Will NASA be able to fly the SLS for Exploration Mission-1 in calendar year 2017? If it will not, please explain what has changed since your testimony on April 24, 2013 and whether, during your testimony on March 27, 2014, you were aware that this flight could be delayed beyond calendar year 2017. Do you stand by your testimony that stated "We have asked for.. .and stated over and over that this is the amount of money that we need to deliver the SLS on the date and time that we said, 2017 for the inaugural mission?" If you do not stand by this testimony, please explain what has changed and how you would update this testimony to more accurately reflect the program's schedule." "According to the program's risk analysis, however, the agency's current funding plan for SLS may be $400 million short of what the program needs to launch by 2017." "Moreover, NASA's estimates do not capture the cost of the second flight of the 70-metric ton vehicle during EM-2, the costs of development work that will be necessary to fly the increased 105- and 130-metric ton SLS capabilities, and the costs associated with legacy hardware that will be used for the Orion program. In contrast, best practices for cost estimation call for "cradle to grave" life cycle cost estimates in order to help assess a program's long-term affordability." By Marc Boucher on August 28, 2014 8:29 AM. 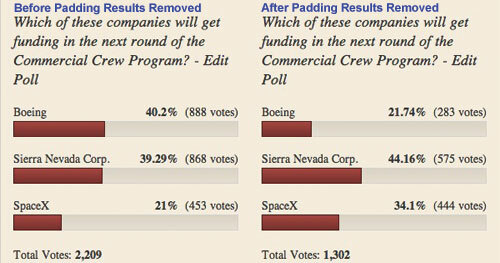 Marc's note: Last week I decided to run a poll on who our readers thought would be selected for funding in the next round of NASA's Commercial Crew Program which many expect to be announced tomorrow. The results were surprising at first. I expected, considering the wide variety of readers we have, to have a very close poll. What I didn't expect was the blatant padding of the results for two of the companies. Until Monday the results were headed to what I was expecting. However at some point on Monday, "block voting" began. The votes were coming from 4 IP addresses. 3 of these IP addresses came Connecticut - specifically from the area around Norwalk (where Boeing has an office). The last IP block was traced to Sierra Nevada Corporation. It should be noted that the poll was setup with cookies so that repeat voting was not allowed. SpaceX votes were distributed across the U.S. and other countries with nothing traceable to a SpaceX office. So presented here are two poll results. As you can see there was considerable padding of the results, but once the block voting was removed it shows a much closer result.You may interpret this unscientific poll anyway you like. By Keith Cowing on August 27, 2014 7:11 PM. "Among the things being announced by NASA was that the launch date for the first SLS mission was being slipped to late 2018 from its current 2017 date. But NASA did not want to call it a slip and said that everyone was still working according the schedule they had been working on. Of course this would mean that NASA has spent the fast few years working toward a date 2018 date while telling the world it was focused on 2017. Later in the telecon NASA said that it might launch the first SLS mission in late 2017 or early 2018. So in other words NASA does not actually have a clear idea when it will launch the first SLS mission. You can be certain that it will slip again - well into 2019 before a first launch date is even discussed. But NASA wants you to know that they have 70% confidence in all of their plans at this point. But when asked what the previous level of confidence was they admitted that they had never done the calculation. So were they more - or less confident prior to this? Given that they just slipped their launch date by a year ..."
"Gerstenmaier extolled media participating in the teleconference not to get "hung up on the first launch date. ... NASA has been saying that the second SLS launch, EM-2, which will be the first to carry a crew, would take place in 2021, but today Gerstenmaier said 2021 or 2022. The launch rate thereafter is only once "every couple of years," Lightfoot said." "But as of today, the only actual missions that are covered by NASA's projected budget are three test flights: the December launch of an uncrewed Orion capsule atop a Delta 4 rocket; the first SLS test flight in 2018; and the first crewed test flight around 2021. While the rockets are considered essential to deep space exploration missions like a proposed asteroid visit and eventual flights to Mars, no such missions are currently funded or even in detailed planning." By Keith Cowing on August 27, 2014 6:01 PM. "At the DRC Trials, Valkyrie experienced a "networking issue" that prevented the team from scoring any points. In the garage before the DRC Trials began, everything worked fine. But on the course itself, the JSC Team "could not communicate with the robot at all." They would later discover the culprit: a network traffic shaping tool that they'd added to their code and that ended up blocking data from the operator to the robot. This manifested itself as a "major instability in the control system," preventing the robot from functioning almost completely." By Keith Cowing on August 27, 2014 3:05 PM. "This decision comes after a thorough review known as Key Decision Point C (KDP-C), which provides a development cost baseline for the 70-metric ton version of the SLS of $7.021 billion from February 2014 through the first launch and a launch readiness schedule based on an initial SLS flight no later than November 2018." "NASA officials will hold a media teleconference at 4 p.m. EDT today to discuss the agency's progress on the Space Launch System (SLS), the heavy-lift rocket under development to take humans beyond Earth orbit and to Mars. The teleconference will be streamed live on NASA's website at: http://www.nasa.gov/newsaudio"
By Keith Cowing on August 26, 2014 10:17 PM. "What we do want to triple-check is whether even highly improbable corner case scenarios have the optimal fault detection and recovery logic. This has already been reviewed by SpaceX and multiple outside agencies, so the most likely outcome is no change. If any changes are made, we will provide as much detail as is allowed under U.S. law." By Keith Cowing on August 25, 2014 9:12 AM. "The space agency has more than 1,500 public-facing websites and 2,000 intranets, extranets and applications, and the agency's data offerings and holdings are huge. "These guys have probably the most expansive list of Web assets," Ananthanpillai said. "That's one of the reasons why everyone's looking at them for lessons learned."" "So, NASA is paying to maintain two MSL websites and the web addresses they give out are different than the actual web addresses - but they won't bother to put the actual addresses in press releases. Meanwhile, NASA is paying for 2 (or 3) MER websites - and again the links put in the press release are not the actual website address." By Keith Cowing on August 25, 2014 7:09 AM. "If we take a look at the relevant section of the federal space program, we will see that the Russian Academy of Sciences is the ISS project customer. Our American partners have said many times they wished to continue the ISS operations after 2020. When they heard our leaders saying that Russia wanted to close down the project in 2020, they fostered the interaction with scientists and made interesting propositions of works in the period after 2020. A yearlong mission of a U.S. astronaut and a Russian cosmonaut to the ISS is scheduled for 2015," the Roscosmos source told Izvestia. He said the Americans had offered the Institute of Medical and Biological Problems of the Russian Academy of Sciences to arrange another yearlong mission experiment. "Meanwhile, Roscosmos is not very interested in halting the ISS works right now: the federal space program of 2006-2015 allots 186.6 billion rubles for the station. If we stop building new modules of the station, considerable funds will be written off and some enterprises will have to start massive dismissals," he added." By Marc Boucher on August 23, 2014 9:53 AM. "An investigation is underway after yesterday's launch by Arianespace of a Soyuz rocket which left its twin payload of Europe's fifth and six Galileo GPS satellites in a lower wrong orbit. According to a statement released by Arianespace "complementary observations gathered after separation of the Galileo FOC M1 satellites on Soyuz Flight VS09 have highlighted a discrepancy between targeted and reached orbit." Marc's note: After congratulatory speeches it was later learned from U.S. military data that the satellites were in the wrong orbit. One of the many questions include why didn't the launch telemetry indicate the wrong orbit? The almost two hour Arianespace broadcast did not indicate anything wrong. Details courtesy Space News Paris Bureau Chief Peter B. de Selding. Marc's update: Based on what we know now this could be a candidate mission for future on-orbit servicing. By Keith Cowing on August 22, 2014 8:39 PM. "Earlier today, in McGregor, Texas, SpaceX conducted a test flight of a three engine version of the F9R test vehicle (successor to Grasshopper). During the flight, an anomaly was detected in the vehicle and the flight termination system automatically terminated the mission. Throughout the test and subsequent flight termination, the vehicle remained in the designated flight area. There were no injuries or near injuries. An FAA representative was present at all times. With research and development projects, detecting vehicle anomalies during the testing is the purpose of the program. Today's test was particularly complex, pushing the limits of the vehicle further than any previous test. As is our practice, the company will be reviewing the flight record details to learn more about the performance of the vehicle prior to our next test. SpaceX will provide another update when the flight data has been fully analyzed." By Keith Cowing on August 22, 2014 6:49 PM. "Former NASA astronaut Steven R. Nagel, who served as a mission specialist on his first space shuttle flight, pilot on his second and commanded his final two, died Aug. 21 after a long illness. He was 67 years old. After retiring from NASA May 31, 2011, he joined the University Of Missouri College of Engineering in Columbia, Missouri. There he served as an instructor in the University's Mechanical and Aerospace Engineering Department." Active Polar Regions on the Moon? By Marc Boucher on August 22, 2014 11:45 AM. "The study, published recently in the Journal of Geophysical Research-Planets, proposes that high-energy particles from uncommon, large solar storms penetrate the moon's frigid, polar regions and electrically charge the soil. The charging may create sparking, or electrostatic breakdown, and this "breakdown weathering" process has possibly changed the very nature of the moon's polar soil, suggesting that permanently shadowed regions, which hold clues to our solar system's past, may be more active than previously thought." By Marc Boucher on August 21, 2014 6:50 PM. "Space Exploration Technologies Corp. employees on Monday launched a putative class action suit in California court accusing it of fostering a racist working environment in which certain workers were subjected to slurs and passed over for promotions, making this the third employee suit to befall the rocket manufacturer in less than a month." Marc's note: I reached out to SpaceX for a comment on this new lawsuit. Here's the response from John Taylor their Communications Director. "SpaceX rejects these allegations and will vigorously defend itself in court. At SpaceX, we don't care about your gender, race, ethnic background, sexual orientation, age or anything else of that nature--to succeed here, the only requirement is to work hard and produce outstanding results. "Earlier this year SpaceX completed its annual review cycle and as a result of those reviews, approximately 4% of our workforce were let go. Given the ambitious goals of the company, the standards for work performance at SpaceX are very high. It is critical that all employees meet this standard." Continue reading SpaceX Faces Another Former Employee Lawsuit . By Keith Cowing on August 21, 2014 5:07 PM. "Traces of plankton and other microorganisms have been found living on the exterior of the International Space Station (ISS), according to Russian space officials. They claim the plankton were not carried there at launch - but are thought to have been blown there by air currents on Earth. Incredibly, the tiny organisms were found to be able to survive in the vacuum of space despite the freezing temperatures, lack of oxygen and cosmic radiation. The discovery was made during a routine spacewalk by Russian cosmonauts Olek Artemyev and Alexander Skvortsov, who were launching nanosatellites into space. They used wipes to polish the surface of windows - also known as illuminators - on the Russian segment of the ISS and later found the presence of plankton and other microorganisms using 'high-precision equipment'. Keith's note: I'm certain that were I to ask CASIS or the ISS National Laboratory folks for a peer-reviewed publication for these results that they'd be more than happy to comply, right? And if this news story is not true, I should expect an equally swift statement to that effect, right? Astrobiologists ought to be jumping up and down about this - if it is true, that is. "As far as we're concerned, we haven't heard any official reports from our Roscosmos (Russia's space agency) colleagues that they've found sea plankton," NASA spokesman Dan Huot told Space.com. "What they're actually looking for is residues that can build up on the visually sensitive elements, like windows, as well as just the hull of the ship itself that will build up whenever they do thruster firings for things like re-boosts. That's what they were taking samples for. I don't know where all the sea plankton talk is coming from." By Marc Boucher on August 21, 2014 2:56 PM. "NASA's spaceflight experts in the Commercial Crew Program (CCP) met throughout July with aerospace partners to review increasingly advanced designs, elements and systems of the spacecraft and launch vehicles under development as part of the space agency's Commercial Crew Integrated Capability (CCiCap) and Commercial Crew Development Round 2 (CCDev2) initiatives." ... "In August or September, NASA plans to award one or more contracts that will provide the agency with commercial services to transport astronauts to and from the International Space Station by the end of 2017." "Boeing recently completed the Phase Two Spacecraft Safety Review of its Crew Space Transportation (CST)-100 spacecraft and the Critical Design Review (CDR) of its integrated systems, meeting all of the company's Commercial Crew Integrated Capability (CCiCap) milestones on time and on budget." By Marc Boucher on August 21, 2014 9:10 AM. "An emerging super-black nanotechnology that promises to make spacecraft instruments more sensitive without enlarging their size will be tested for the first time on the International Space Station within a year." By Marc Boucher on August 21, 2014 8:40 AM. "Steve Jurvetson is one of the commercial space industry's most successful investors. He is a partner of Draper Fisher Jurvetson, where he serves on the boards of Planet Labs, SpaceX, Synthetic Genomics and Tesla Motors." By Marc Boucher on August 21, 2014 8:34 AM. "Of all the planets NASA has explored, none have matched the dynamic complexity of our own. Earth is constantly changing, and NASA are working constantly to explore and understand the planet on scales from local to global." Where's the Ozone Damaging Carbon Tetrachloride Coming From? By Marc Boucher on August 20, 2014 2:56 PM. "NASA research shows Earth's atmosphere contains an unexpectedly large amount of an ozone-depleting compound from an unknown source decades after the compound was banned worldwide." By Marc Boucher on August 20, 2014 2:47 PM. "This video shows a timelapse of the Orbital Science's Cygnus Orb-2 spacecraft departing from the International Space Station on 15 August 2014." By Marc Boucher on August 20, 2014 8:29 AM. Space Exploration Technologies, the commercial space transportation startup founded by Elon Musk with ambitions to land people on Mars, is raising investment that values the company somewhere south of $10 billion, TechCrunch has learned. "SpaceX is not currently raising any funding nor has any external valuation of that magnitude or higher been done," John Taylor, a company spokesman, said in an e-mail. "The source in this [TechCrunch] report is mistaken." Marc's note: It should be noted SpaceX did not refute the original story by Quartz in April where Quartz said SpaceX was close to closing a round of funding at that time. By Marc Boucher on August 19, 2014 5:16 PM. "Northrop Grumman Corporation (NOC) with Scaled Composites and Virgin Galactic is developing a preliminary design and flight demonstration plan for the Defense Advanced Research Projects Agency's (DARPA) Experimental Spaceplane XS-1 program. XS-1 has a reusable booster that when coupled with an expendable upper stage provides affordable, available and responsive space lift for 3,000-pound class spacecraft into low Earth orbit. Reusable boosters with aircraft-like operations provide a breakthrough in space lift costs for this payload class, enabling new generations of lower cost, innovative and more resilient spacecraft." CCtCAP Commercial Crew Announcement - Soon? By Keith Cowing on August 18, 2014 4:38 PM. "NASA declined today (August 18) to confirm rumors that it will announce the winner(s) of the Commercial Crew Transportation Capability (CCtCAP) contract by the end of the month, but anticipation is mounting. Whenever it happens, it will be a major step forward for the commercial crew program and achieving the oft-stated goal of restoring America's ability to launch American astronauts into space on American rockets from American soil. A NASA spokesman replied to an email query this morning by saying only that NASA still expects to make an announcement in the late-August, early-September time frame, as it has been saying for months. NASA officials are not allowed to discuss the selection process before announcing the award(s), even to say who submitted bids. Expectations are that at least the three companies being funded under the current phase of the program - Commercial Crew Integrated Capability (CCiCAP) - did so." "Almost five years after beginning its search for a U.S.-developed spacecraft to carry humans into orbit, NASA is poised to award at least one contract to its industry partners in the Commercial Crew Program." By Marc Boucher on August 18, 2014 11:17 AM. "In this session, representatives of agencies, organizations, and communities that make use of space-based remote sensing data in support of scientific and societal needs will discuss those uses, including both those now carried out using existing data, as well as potential future uses based on the data that are anticipated to become available in the future. Uses will cover topics such as operational forecasting/prediction, resource management, policy development, scientific assessment, and commercial product development." By Keith Cowing on August 17, 2014 7:39 PM. "Space Exploration Technologies Corporation -- SpaceX -- has won broad support in Washington by offering a low-cost, innovative alternative to traditional launch providers for lofting satellites into orbit. However, the company is struggling to meet commitments to its government customer, and eventually that may tarnish its image. ... I have written a commentary for Forbes here." Keith's note: The Forbes article that Thompson refers to at Forbes is no longer online. Several websites have apparently reprinted the article such as this one [update - now removed]. Hmmm why did Forbes pull this article offline? Could it be that the article was ... inaccurate? "SpaceX is no stranger to both strong support and harsh criticism of its activities, particularly in political circles. Last month, for example, three members of the House of Representatives asked NASA for details on an "epidemic of anomalies" they claimed the company's Falcon 9 rocket and Dragon spacecraft have experienced. But the company's decision early this month to establish a commercial launch site near Brownsville, Texas, generated praise from various officials, including US Sen. John Cornyn (R-TX) and Rep. Filemon Vela (D-TX)." By Marc Boucher on August 17, 2014 10:58 AM. "At this years AIAA Space 2014 conference a panel of experts from industry and government discussed Emerging Space: The Next Industrial Revolution. The availability of the International Space Station and the corresponding improved access to and from LEO has ushered in the start of a new entrepreneurial renaissance. In addition there are companies exploring revolutionary approaches to Earth observation, space manufacturing, and resource utilization of the lunar and asteroidal material. This panel will explore the broad sweep of possible applications as well as looking at how these companies could combine to form a new commercial space ecosystem." By Keith Cowing on August 14, 2014 8:06 PM. "In the next session, with USNORTHCOM chief Adm. Charles Jacoby, Stewart approached the three of us media and said she'd heard we were taking pictures of the presentations and slides. This is not allowed, she said, and she would have officers compel us to remove these files from our phones. The three of us noted her concerns but declined; she eventually walked away. Anticipating a phone show down, I tweeted the slides." "During his presentation to the full room of SMD attendees, [Vice Admiral James Syring, Director of the Missile Defense Agency] showed a series of slides detailing work done by MDA. Using slides is a common procedure at such conferences and it's typical for reporters and others to take pictures and post the slides to social media or use them for future reference when writing about the presentation. At the bottom of Syring's slides were the words "Approved for Public Release." [Amy Butler senior Pentagon editor for Aviation Week] started tweeting images of 12 slides in succession. At the bottom of Syring's slides were the words "Approved for Public Release." Butler started tweeting images of 12 slides in succession. That's when things took a turn for the worse." "Reporters and even patrons were sternly warned by on-site security not to take photos anywhere in the Von Braun Center, even though there was no mention of such a policy in writing, on signs or on the conference website. During Syring's speech, a number of reporters tweeted pictures of his briefing slides that contained historical information about US missile defense tests conducted over the past 20 years. The slides were marked "Approved for Public Release." By Marc Boucher on August 14, 2014 6:53 PM. "SpaceX has released a video from the July 14th launch of a Falcon 9 rocket carrying six ORBCOM satellites showing the first stage reentry from a chase plane." By Marc Boucher on August 14, 2014 10:06 AM. "Bigelow Aerospace has released a promotional video on their Bigelow Expandable Activity Module (BEAM). It runs six and a half minutes and includes new footage." By Keith Cowing on August 13, 2014 2:26 PM. "This successful vote will allow us to work with management to improve working conditions for NASA support and administrative staff here at NASA headquarters, thereby improving operations, saving money, and retaining an engaged and professional workforce," said Tifarah Thomas, a program specialist within NASA's Office of the Chief Health & Medical Officer. Professional support specialists at NASA headquarters include budget analysts, policy analysts, administrative specialists, secretaries, and others." By Marc Boucher on August 13, 2014 8:21 AM. "At this years AIAA Space 2014 conference a panel of experts from NASA and industry discussed the building blocks of to Mars. The panel discussion: The first step on a path of exploration that will lead to human landings on Mars will be taken in the coming months with the Exploration Flight Test 1 of Orion on a Delta IV Heavy rocket. After that, Orion and Space Launch System will begin a series of exploration missions that will lead to human journeys to Mars. As a capabilities-driven framework, these systems will enable a variety of potential paths to the Red Planet." Marc's note: The panel discussed the "current" NASA approach. Politics, the private sector, other efforts outside the U.S. were not part of the discussion. By Keith Cowing on August 12, 2014 8:31 PM. Keith's note: If Harold White's warp drive research is so exciting why won't NASA openly talk about it? Why aren't REAL experts in the field raving about it? It would be entertaining (and no doubt embarrassing) to watch Harold White explain his warp drive technobabble to actual experts in the field. But we won't see White and his warp drive research in a regular scientific forum any time soon. NASA JSC is afraid to let this happen - and NASA HQ is afraid to push JSC on this issue. When the movie "Interstellar" comes out NASA is going to have to say *something* about the warp drive research they have been funding with everyone's tax dollars. If they don't say something then people are going to ask why. White spoke at NASA Ames today. A video of this presentation is supposed to be posted on YouTube "in a month" according to ARC. The sooner that White's warp drive presentation is posted for all to hear, the sooner NASA can either endorse White's research - or not endorse it. By Marc Boucher on August 12, 2014 10:59 AM. "At this years AIAA Space 2014 conference NASA provided a panel of experts to discuss their Exploration Technology. The panel focused on the importance of sustained space technology investments to current and future explorations missions with special emphasis on future asteroid and Mars mission requirements. The panelists also discussed recent technology project successes and challenges." By Marc Boucher on August 12, 2014 10:37 AM. "NASA has released its quarterly from the Exploration Systems Division on the ongoing Orion, Space Launch System, Ground Systems Development and Operations programs for April, May and June of 2014." By Keith Cowing on August 11, 2014 4:38 PM. "I hadn't been aware that, if you ask NASA nicely, you'll be allowed to take the controls of a satellite floating in outer space. Clearly, I need to get out more, as this is what a group of very interested civilians are doing from their headquarters in a McDonald's." "Our plucky crowdfunded spacecraft has been getting into all sorts of productive mischief, from detecting a solar burst to worming its way into Google Chrome's interactive heart. Today ISEE-3 will be making its closest approach to the moon, and you can watch live with commentary from the project experts." "Dr. Coplan had largely forgotten about the experiment after they received the last data in the late 1980s. This year, to clear space in a laboratory he would be sharing with another scientist, he threw out his ISEE-3 data notebooks. Then, in June, one of his former students heard about the reboot project and told Dr. Coplan, who went to the waste bin and found the notebooks. "That sat around for a while, fortunately," he said." Who Will Win the Next Round for the Commercial Crew Program? By Marc Boucher on August 11, 2014 12:52 PM. "NASA should make its decision on the "commercial crew" competition in the next few weeks. At stake is not just a $4 billion contract, but prestige. The next spacecraft that flies U.S. astronauts will have an American flag, yes, but also a prominent corporate logo. That company will also join the elite club - whose only members include the United States, Russia and China - that has flown humans in space." Marc's note: Insider vs outsider, who will win? Also, while the article overall is worth reading, the characterization of Senator Bill Nelson as "a former astronaut" is misleading if you don't the know history. Nelson indeed did fly as a mission specialist on STS-61C, but he was a member of the U.S. House of Representatives at the time and like Senator Jake Garn who preceded him the year before, he flew on the Space Shuttle because of his role in the House of Representatives. By Marc Boucher on August 11, 2014 11:15 AM. "Currently, over "$500 billion dollars in satellite assets are stationed in geosynchronous orbit (GEO)," according to Gordon Roesler, a program manager in the Tactical Technology Office at the Defense Advanced Projects Research Agency (DARPA), and if those assets break down, "given the remote, heavily radiated atmosphere of GEO, a company only has one replacement option at this time - launching a replacement system." By Marc Boucher on August 11, 2014 10:29 AM. "In an extensive study of sleep monitoring and sleeping pill use in astronauts, researchers from Brigham and Women's Hospital (BWH) Division of Sleep and Circadian Disorders, Harvard Medical School, and the University of Colorado found that astronauts suffer considerable sleep deficiency in the weeks leading up to and during space flight. The research also highlights widespread use of sleeping medication use among astronauts." By Marc Boucher on August 11, 2014 10:22 AM. By Keith Cowing on August 9, 2014 3:29 PM. Join the hangout live as the ISEE-3 spacecraft makes it's long-awaited lunar flyby after 36 years in interplanetary space. Flip between the 3D realtime trajectory and the live video program. Live from ISEE-3 Reboot headquarters, a special moderated by The Sky at Night's Chris Lintott and featuring scientists and experts from around the world all brought together for this historic event. By Keith Cowing on August 8, 2014 4:00 PM. "We are excited to let all of you know about the newly announced collaboration between the ISEE-3 Reboot Project and Google. The main feature of this is a new website developed by Google Creative Lab in collaboration with the ISEE-3 Reboot Project team that features a history of the ISEE-3 mission as well as a presentation of data currently being received from ISEE-3." By Marc Boucher on August 8, 2014 2:10 PM. "Today NASA held a briefing on its recent Low-Density Supersonic Decelerator (LDSD) project test. LDSD is a rocket-powered, saucer-shaped test vehicle which may be used on future planetary missions." By Keith Cowing on August 8, 2014 12:42 PM. "As promised, the time of closest approach to the Moon is 18:16 UTC (on Sunday, 10 August). Vassilis Angelopolous at UCLA is now involved. He has two spacecraft in lunar orbit and is planning to acquire data during the ISEE flyby in a special telemetry mode. That should add immeasurably to the scientific results. The telemetry signal continues to improve. There is still random telemetry noise but few if any long gaps so there is little disruption of the data and real signals are becoming clear. Don Gurnett's team (SCH or Plasma Waves) recently reported seeing Auroral Kilometric Radiation from Earth, ion acoustic waves in the solar wind and electron plasma oscillations usually caused by a shock wave. They are debating whether they are seeing waves from Earth's bow shock or an interplanetary shock." By Marc Boucher on August 8, 2014 9:48 AM. "Our world is becoming rapidly connected and as humanity ventures off planet they will take their appetites for LOLz, cat memes, silly YouTube videos, and iTunes with them making a need for space-based internet and other broadband services a reality according to panelists speaking on "The Future of Space-Based Communications" at the AIAA SPACE 2014 Forum in San Diego." By Keith Cowing on August 8, 2014 7:44 AM. "Space Exploration Technologies Corp. is facing a putative class action in California court accusing it of not properly notifying its former employees of a mass layoff of up to roughly 400 workers in the state, and not paying them wages earned before termination. The proposed class action, filed Monday, alleged that SpaceX ordered the mass layoffs of between 200 and 400 workers on or about July 21 without giving advance notice to the them, in violation of California's Worker Adjustment and Retraining Notification Act." "The lawsuit, filed Aug. 4 in the California Superior Court for the County of Los Angeles, appears to hinge on whether SpaceX's dismissal of several hundred employees is viewed by the court as a "layoff." The lawsuit says that under California law, a "layoff" is defined as "a separation from a position for lack of funds or lack of work." By Marc Boucher on August 7, 2014 1:15 PM. "Looking ahead to an exciting future, NASA is continuing to invest in concepts that may one day revolutionize how we live and work in space with the selection of five technology proposals for continued study under the NASA Innovative Advanced Concepts (NIAC) Program." Continue reading NIAC Funds Five Concepts. By Marc Boucher on August 7, 2014 9:15 AM. "The nation's commercial spaceport network will be expanding from the "8 that are operating now, to 17 in the next few years," Brian Gulliver, a spaceport development team leader at Reynolds, Smith and Hills, told an audience attending the panel "An Expanding Network of Commercial Spaceports" this morning at the AIAA SPACE 2014 Forum in San Diego." By Keith Cowing on August 6, 2014 9:07 PM. "Worst of all is this statement from the paper: "Thrust was observed on both test articles, even though one of the test articles was designed with the expectation that it would not produce thrust." In other words, the Cannae Drive worked when it was set up correctly--but it worked just as well when it was intentionally disabled set up incorrectly. Somehow the NASA researchers report this as a validation, rather than invalidation, of the device." "Carroll's final point - that the researchers measured thrust not only when the drive was configured to produce it, but also when set up to do nothing at all - may be the most important takeaway of all." By Marc Boucher on August 6, 2014 11:12 AM. "Sierra Nevada Corporation's (SNC) Dream Chaser spacecraft is "on track for its anticipated first launch in November 2016," Mark Sirangelo, corporate vice president of SNC Space Systems, told a press conference on August 5, 2014, at the AIAA SPACE 2014 Forum in San Diego." "The Sierra Nevada Corporation (SNC) has announced an expansion of its Dream Chaser program, which now includes a mix of small businesses, legacy aerospace firms, university partners, and foreign space operation organizations, in "32 states, 50 Congressional districts, and 2 foreign nations." By Marc Boucher on August 6, 2014 10:05 AM. "Past missions, and in some case the spare parts of past missions, will help drive the next decade of Mars exploration, a panel of experts from NASA's Jet Propulsion Laboratory (JPL) and the University of California at Berkeley, told an audience yesterday at the AIAA SPACE 2014 Forum in San Diego." By Marc Boucher on August 6, 2014 9:07 AM. Marc's note: ESA has released these detailed images from Rosetta of Comet 67P/Churyumov-Gerasimenko now that it's in "orbit". The images use the OSIRIS narrow-angle camera from a distance of 285 km. Image resolution is 5.3 metres/pixel. By Marc Boucher on August 5, 2014 5:38 PM. "On October 19, 2014, at 18:32 UTC, Comet Siding Spring (2013A1) will pass Mars at roughly 150,000 kilometers, about 1/3 the distance between Earth and the Moon, in a direction putting it on a track for its dust to pass over the Martian North Pole, possibly endangering, over a thirty minute window, the collection of orbital spacecraft currently on station in that region." By Marc Boucher on August 5, 2014 9:34 AM. "Texas Governor Rick Perry announced that the state of Texas will provide incentives to SpaceX so that the company can build a commercial spaceport in Cameron County. The incentives include $2.3 million from the Texas Enterprise Fund (TEF). As well the state will provide $13 million from the Spaceport Trust Fund to the Cameron County Spaceport Development Corp. to support the development of infrastructure necessary for establishing a spaceport." Marc's note: Hours after signing the agreement with Texas SpaceX launched AsiaSat 8 (Watch). By Keith Cowing on August 1, 2014 10:24 PM. "Traditionally, NAC findings and recommendations are sent to the NASA Administrator in a letter from the NAC Chair. Eventually the Administrator responds and the exchange is posted on the NAC website and they receive little notice. Today, NAC member Miles O'Brien suggested that NAC issue a press release to raise awareness of these issues. The other NAC members, including Squyres, were enthusiastic about the idea. It apparently would be a precedent-setting event. Squyres seemed to feel it is in keeping with the goal he and Bolden share to make NAC more effective. Squyres says he will try to have a press release issued after he formally transmits all of NAC's findings and recommendations to Bolden in about two weeks." By Keith Cowing on August 1, 2014 6:33 PM. "We are counting on our Product Units (PUDs) and their business development managers (BDMs) to identify and pursue opportunities for the Center make even more significant contributions to mission directorate programs and projects in collaboration with the other NASA Centers, government agencies, academia and industry. We are counting on our seven Product Line Leads (PLLs) to identify integrated, systems level, state-of-the-art multidisciplinary solutions to those Agency needs. We are counting on our Core Resource Units (CRUDs) to acquire, develop and nurture the capabilities (skills, facilities and computational tools) required to develop and implement those solutions."